Salt and Blood Pressure: Can It Really Lower Yours? One of the first salt and blood pressure questions people ask is, "Doesn't salt make your blood pressure go up?" The answer is yes and no. As frustrating as this answer may be, it is the right answer. Excess table salt will increase your blood pressure. But, the latest research also finds that not having enough salt will put you at increased risk of cardiac related diseases. 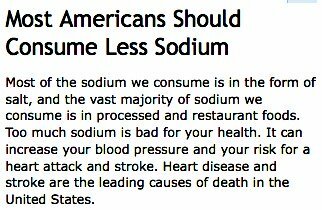 Yes, if you eat less salt, you will be at increased risk of heart and other health issues. However, the high blood pressure risk is true of table salt, but not natural unprocessed salt (more on this option below). Both headlines are accurate and were taken from the CDC website (as of this writing). Click on the headlines to see the actual pages. Two Headlines, Two Findings, Which is Right? Why Not Drink More Water? Excess table salt raises blood pressure. Unprocessed sea salt most often lowers blood pressure. What if there was a better way? What if there was a way that worked? What if salt could lower your blood pressure? Back to the question, doesn't salt raise your blood pressure? Actually, unprocessed sea salt lowers blood pressure in most cases. It is not just the sea salt, rather, it is the combination of salt and minerals that act as buffers that makes it work. When we increase our water and sea salt intake, we optimize our ability to have normal blood pressure. High blood pressure is a sign and symptom of chronic fluid and electrolyte imbalance. When we do not have enough water, enough electrolytes and enough of the right minerals, we are more likely to get high blood pressure. Studies show that adding magnesium, potassium and other minerals all work together to help our body function at optimal levels. Those alone can lower our blood pressure without any drugs. Increasing those minerals can also lower our coronary disease risk. As you read on, do not think you need to run out and get supplements. The answer is much tastier, much more enjoyable and probably in your cupboard. Magnesium Intake inversely associated with coronary disease. The conclusion of this and many other studies found that those who took in about 50 mg a day of magnesium had less risk of heart disease. Based on the CDC guideline revisions, depending on our body weight, we need to take about 1 3/4 teaspoons of unprocessed sea salt to a maximum of 3 table spoons of unprocessed sea salt. These numbers are dependent on water consumption. At these levels, we would be getting between 31 to 60 mg of magnesium along with other essential mineral nutrients (5.2 mg magnesium per 1/4 tsp of Celtic sea salt dissolved in the mouth and 1 liter of water consumed). Forget the science, what about the real world benefits. Does it work? To date, of those who reported back to the Water Cures or among our water coaches, only one person had a increased blood pressure reaction to the salt. We do not know the cause of the hypertension. Did they fail to drink or drink enough water with the salt? There could have been numerous reasons starting with following the protocol improperly. There have been tens of thousands who have had success with the water cures protocol. The majority of those following the protocol have dramatic results. What kind of results from following the water cures protocol? Example witnessed by a RN hydration coach: Chest pain relieved in 45 seconds with a pinch of salt and glass of water. Note, the second nitro pill had not been effective. Example related over phone to a water coach as it was happening: Blood pressure 210/110 reduced to 140 / 80 in 70 year old woman after third glass of water and third pinch of salt. Thankfully, she refused to go to the hospital and tried the water cures protocol. These are only a few of the heart health benefits of using sea salt. There are so many more benefits. Wheres the Salt and Blood Pressure Science? In time, we hope to be funding scientific studies to lower the cost of health care and increase the beneficial outcomes. As we progress in developing our non-profit organization, we will work for the science to help change medicine. Till then, tell others about this and share your successes with the use of salt and blood pressure being lowered.